Cette semaine ¿ Que Vola? fait partie de la playlist du New York Times ! 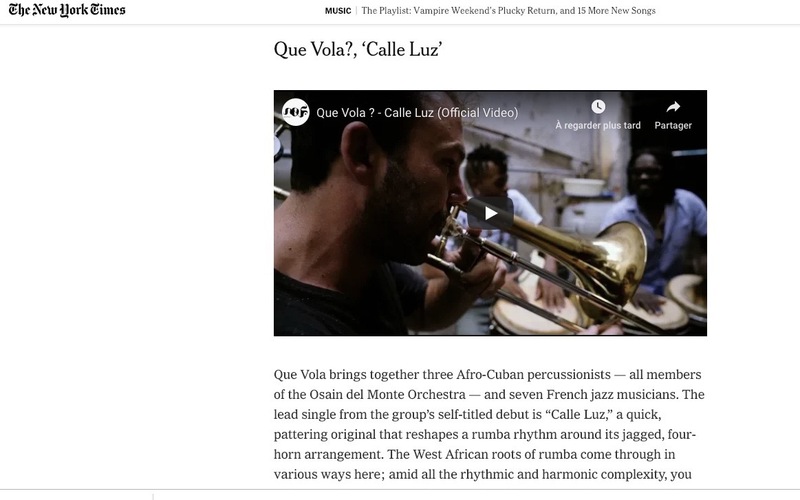 Que Vola brings together three Afro-Cuban percussionists — all members of the Osain del Monte Orchestra — and seven French jazz musicians. The lead single from the group’s self-titled debut is “Calle Luz,” a quick, pattering original that reshapes a rumba rhythm around its jagged, four-horn arrangement. The West African roots of rumba come through in various ways here; amid all the rhythmic and harmonic complexity, you might even hear echoes of Fela Kuti’s Africa ’70 band in the sound of the Rhodes, bass and drums. Nous serons en concert au Lincoln Center à New York le 27 juin prochain dans le cadre de la tournée d’anniversaire des 15 ans de notre label No Format !